I’m not really good at following decorating rules. I’m just not. I live in Iowa. My friends think I’m famous because I write a silly blog. Who needs decorating rules? Like rug size. Who cares what the “rules” are in regards to rug size? Not this Midwest girl. Especially not me 3 years ago. Well, hello baby 3’x5’ rug. You’re so tiny and cute….and totally way too small for this room. I told myself this totally worked…because I still had $100,000 in student loans…and I knew zero about decorating. Totally works. Totally works. Slowly I began to learn that at least the couches should touch the rug. Do you know how much large rugs cost? A lot of money. That’s how much. But I should upgrade. That rug above just isn’t cutting it. How about a 5’x8’? That will totally work. I can’t find a view from above but as you can see, the size is better. Pretty decent. But still small. 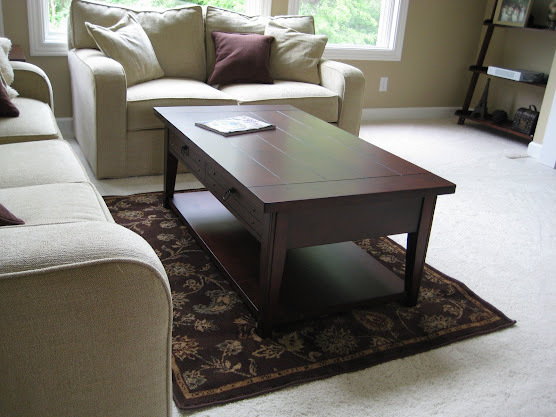 One popular rule that I have found is that the rug should be large enough to slide under the front legs of sofas and chairs in a seating arrangement. 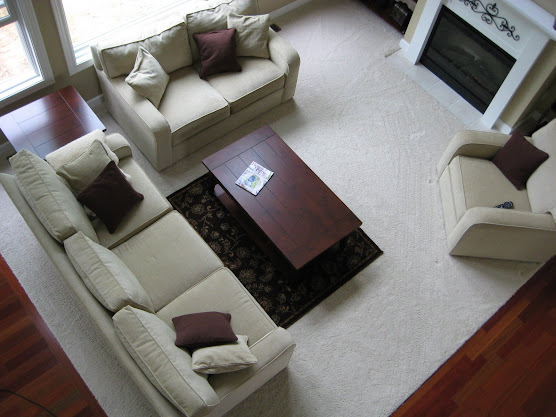 All the legs touching the rug helps unify the furniture. I agree. I also agree that the “rule” depends on your room. The “all front legs touching” thing may not work for every room situation. Rules. Schmules. I also think I need to scoot the chair closer. Thanks view from the walkway. Now I think I need a round coffee table to balance out all of that square. I should research coffee table rules. Or stop learning decorating things. The latter would probably make my husband happy. Do you follow decorating “rules”? Are you currently breaking any decorating “rules”?